T.G.I.F. 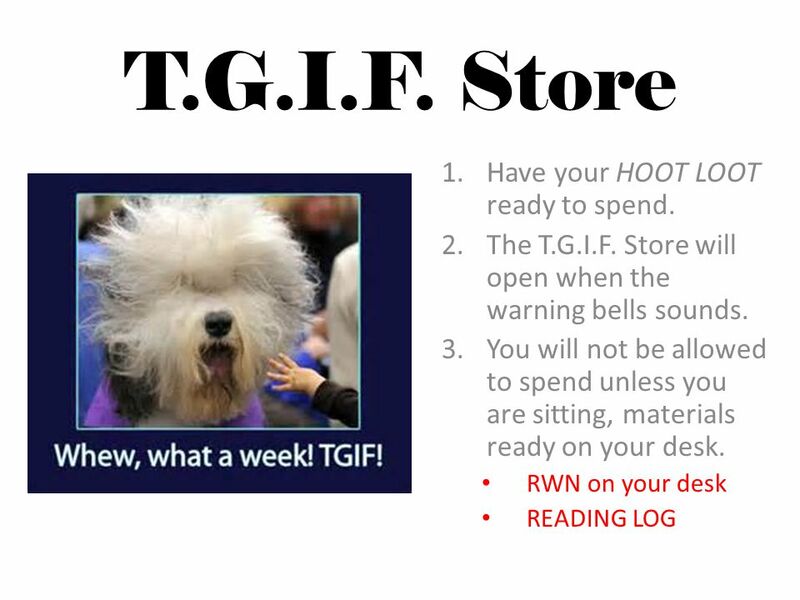 Store 1.Have your HOOT LOOT ready to spend. 2.The T.G.I.F. Store will open when the warning bells sounds. 3.You will not be allowed to spend. 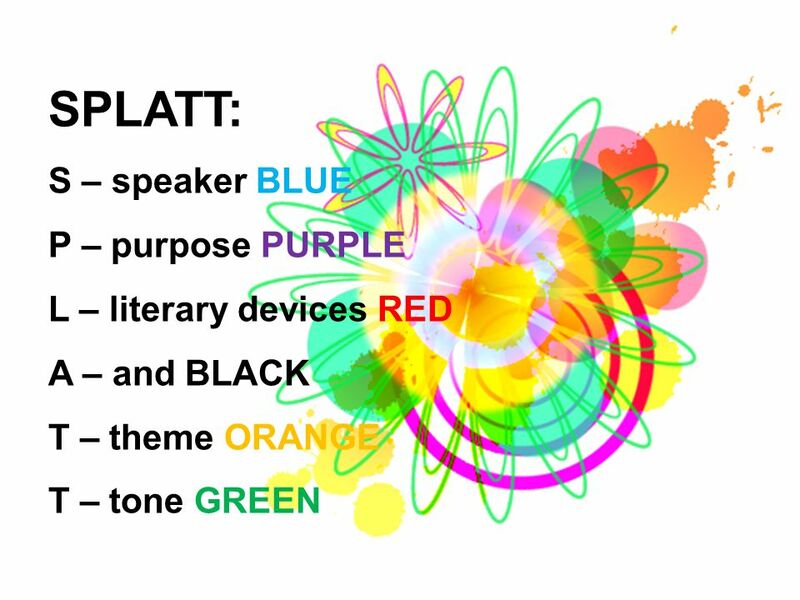 3 Friday, October 25, 2013 Friday Trivia Instructions: YOU DO NOT HAVE TO WRITE ANYTHING, JUST THINK. PLEASE, DO NOT SHOUT THE ANSWER OR SHARE THE ANSWER!! 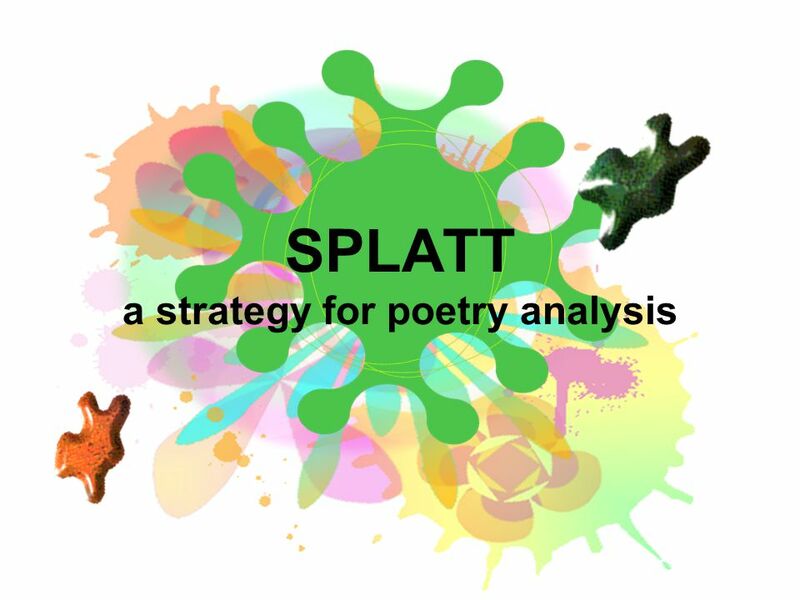 8 Splatt, gives the reader direction for the analysis of the poem. 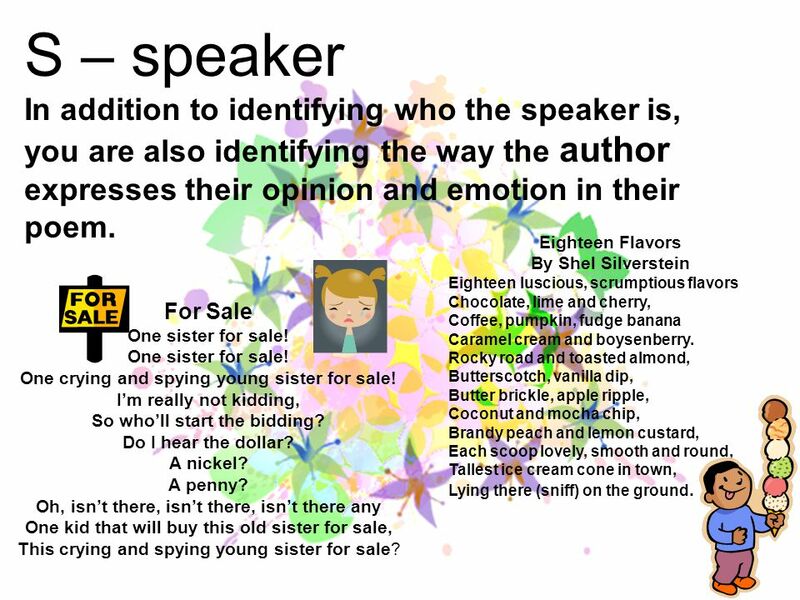 9 S – speaker In addition to identifying who the speaker is, you are also identifying the way the author expresses their opinion and emotion in their poem. For Sale One sister for sale! One crying and spying young sister for sale! I’m really not kidding, So who’ll start the bidding? Do I hear the dollar? A nickel? A penny? Oh, isn’t there, isn’t there, isn’t there any One kid that will buy this old sister for sale, This crying and spying young sister for sale? Eighteen Flavors By Shel Silverstein Eighteen luscious, scrumptious flavors Chocolate, lime and cherry, Coffee, pumpkin, fudge banana Caramel cream and boysenberry. Rocky road and toasted almond, Butterscotch, vanilla dip, Butter brickle, apple ripple, Coconut and mocha chip, Brandy peach and lemon custard, Each scoop lovely, smooth and round, Tallest ice cream cone in town, Lying there (sniff) on the ground. 10 P - purpose Just like personal narratives, the reader still needs to determine the purpose of the writing. 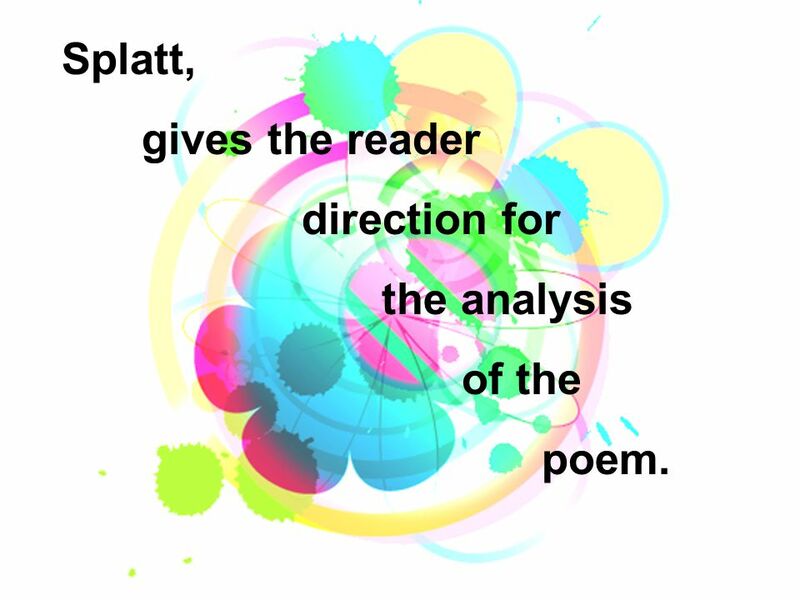 Poetry has a purpose just like any other written work. The Boa Constrictor Song I'm being swallered by a Boa Constrictor a Boa Constrictor, a Boa Constrictor I'm being swallered by a Boa Constrictor and I don't - like snakes - one bit! Oh no, he swallered my toe. Oh gee, he swallered my knee. Oh fiddle, he swallered my middle. Oh what a pest, he swallered my chest. Oh heck, he swallered my neck. Oh, dread, he swallered my - (BURP) Green and speckled legs, Hop on logs and lily pads Splash in cool water. 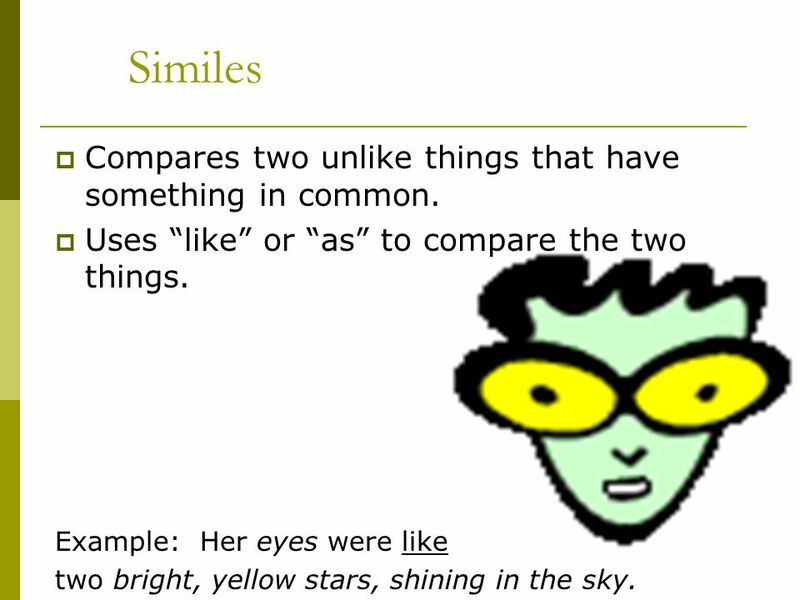 12 Similes  Compares two unlike things that have something in common. 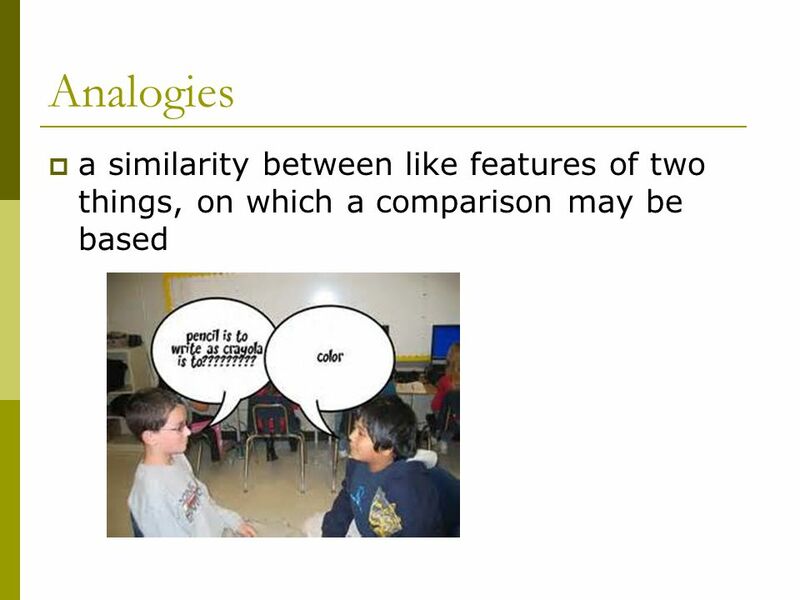  Uses “like” or “as” to compare the two things. Example: Her eyes were like two bright, yellow stars, shining in the sky. 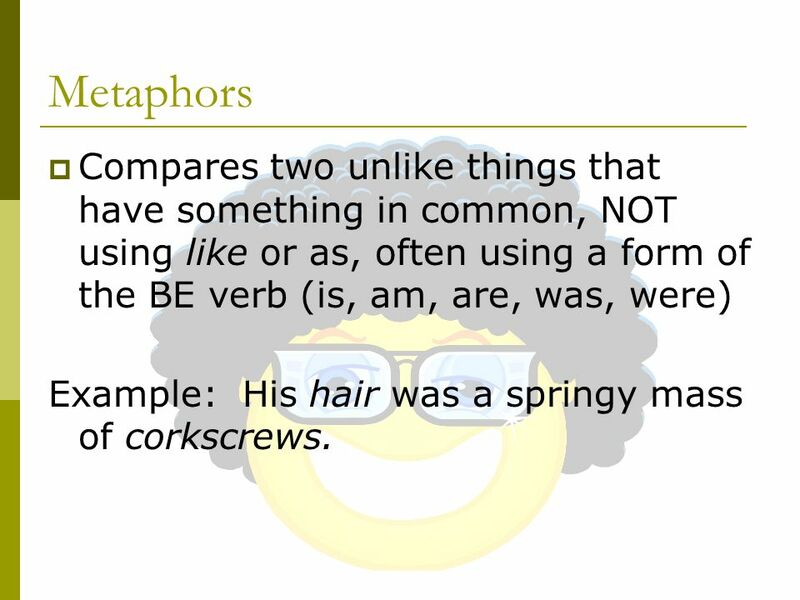 13 Metaphors  Compares two unlike things that have something in common, NOT using like or as, often using a form of the BE verb (is, am, are, was, were) Example: His hair was a springy mass of corkscrews. 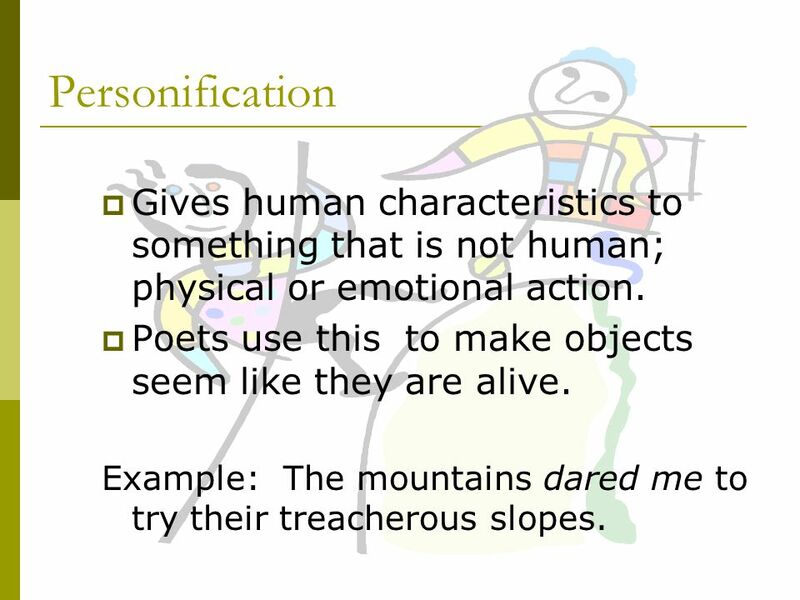 14 Personification  Gives human characteristics to something that is not human; physical or emotional action.  Poets use this to make objects seem like they are alive. Example: The mountains dared me to try their treacherous slopes. 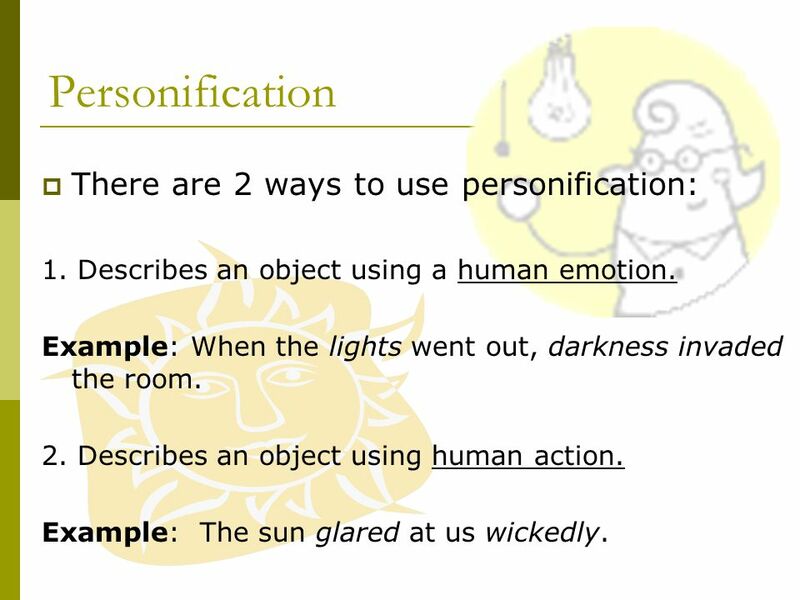 15 Personification  There are 2 ways to use personification: 1. 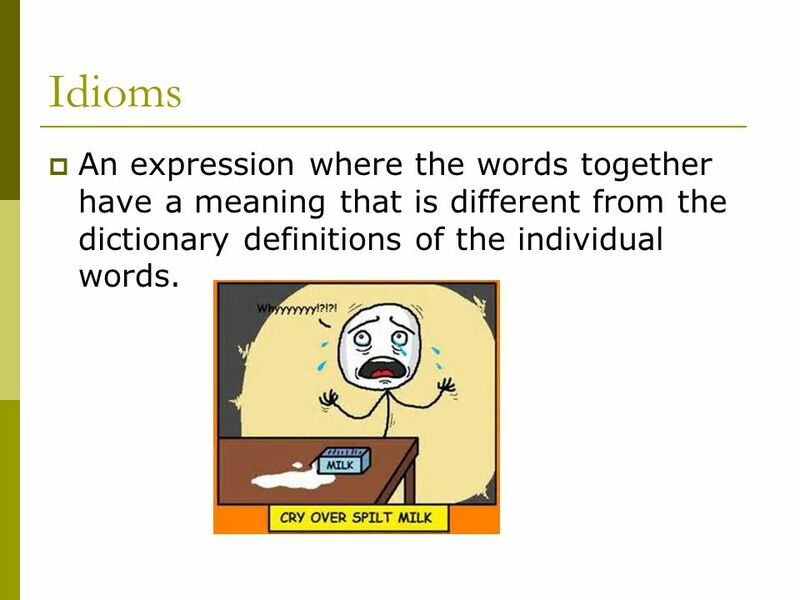 Describes an object using a human emotion. Example: When the lights went out, darkness invaded the room. 2. Describes an object using human action. Example: The sun glared at us wickedly. 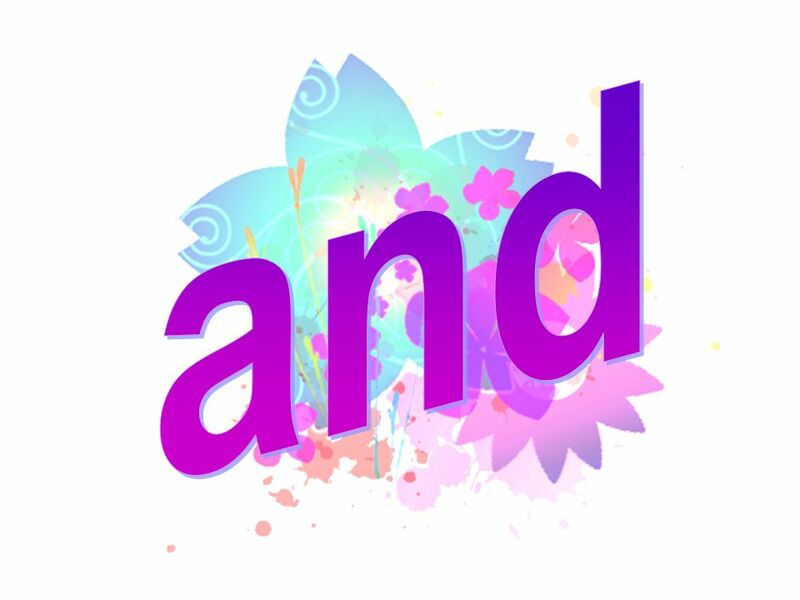 16 Alliteration  Consonant sounds that are repeated at the beginning of two or more words. 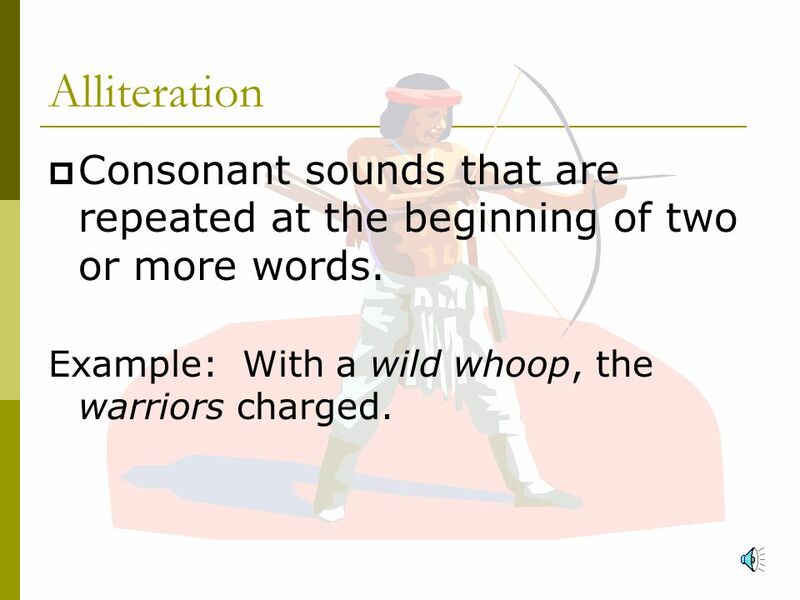 Example: With a wild whoop, the warriors charged. 17 Onomatopoeia  Words that imitate sounds. 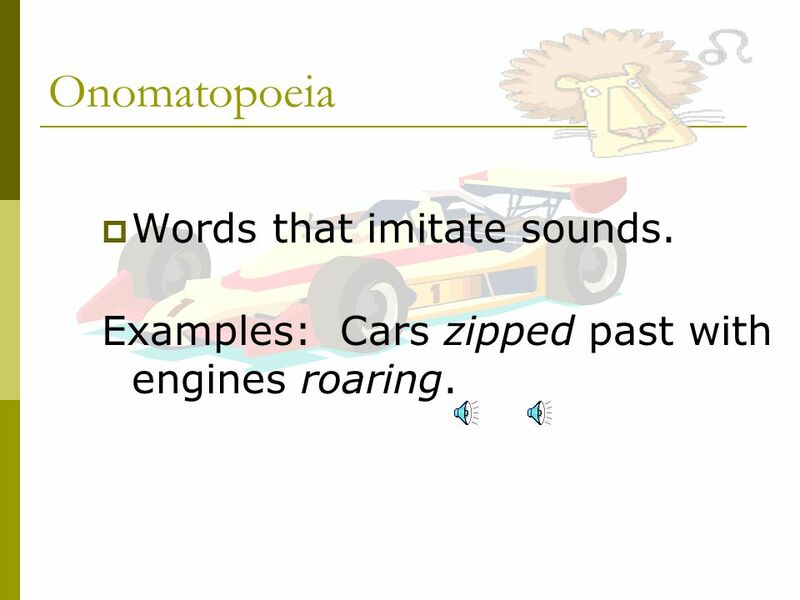 Examples: Cars zipped past with engines roaring. 18 Idioms  An expression where the words together have a meaning that is different from the dictionary definitions of the individual words. 22 T – tone Tone describes the author’s attitude toward his subject. Tone reflects the author’s purpose. If the author’s purpose is to inform, the tone may be serious. 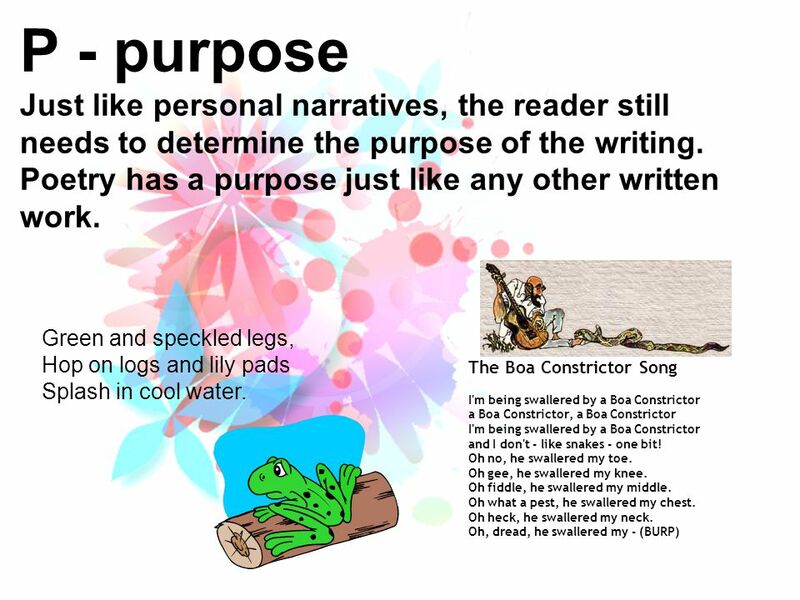 If the author’s purpose is to entertain, the tone may be humorous. Tone is not stated directly. 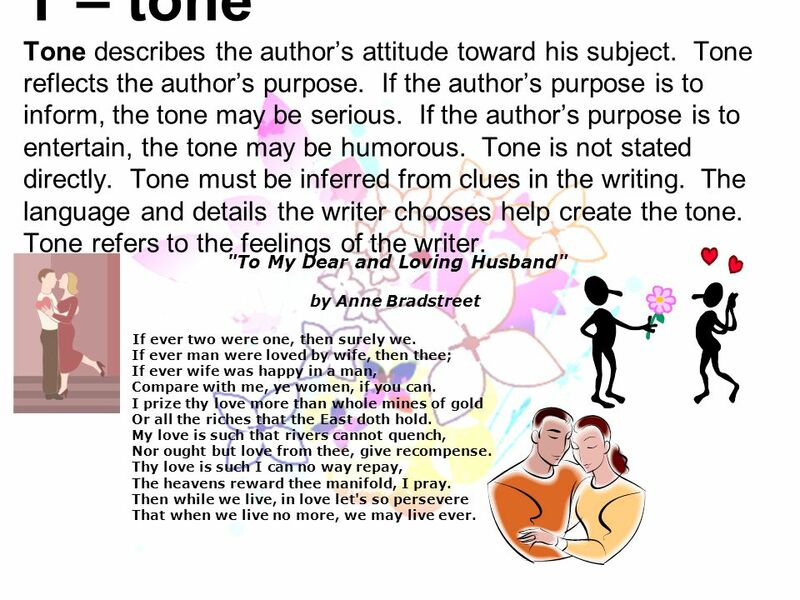 Tone must be inferred from clues in the writing. 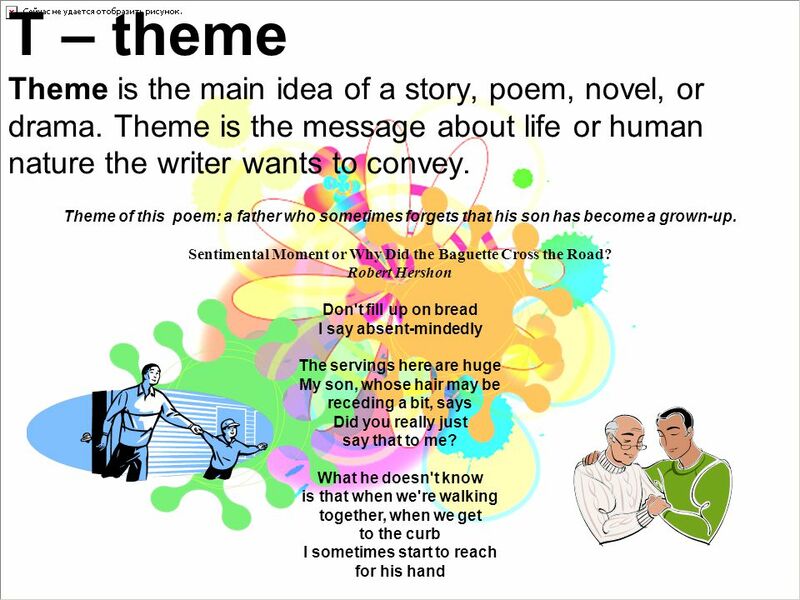 The language and details the writer chooses help create the tone. Tone refers to the feelings of the writer. "To My Dear and Loving Husband" by Anne Bradstreet If ever two were one, then surely we. If ever man were loved by wife, then thee; If ever wife was happy in a man, Compare with me, ye women, if you can. I prize thy love more than whole mines of gold Or all the riches that the East doth hold. My love is such that rivers cannot quench, Nor ought but love from thee, give recompense. Thy love is such I can no way repay, The heavens reward thee manifold, I pray. Then while we live, in love let's so persevere That when we live no more, we may live ever. Download ppt "T.G.I.F. Store 1.Have your HOOT LOOT ready to spend. 2.The T.G.I.F. Store will open when the warning bells sounds. 3.You will not be allowed to spend." You have entered… THE F.U.N. Club READING ZONE!!! ARE YOU PAYING ATTENTION… Please maintain a quiet environment for reading. Find your F.U.N. CLUB FOLDER. Puritanism = Unit One Puritan Plain Style. 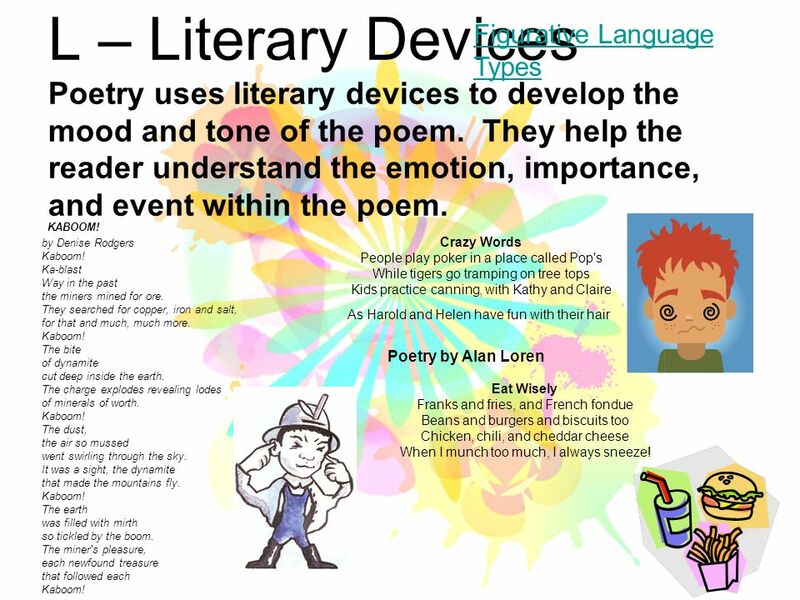 Poetry Notes There are many literary devices commonly used to enrich the meaning and sound of poetry. 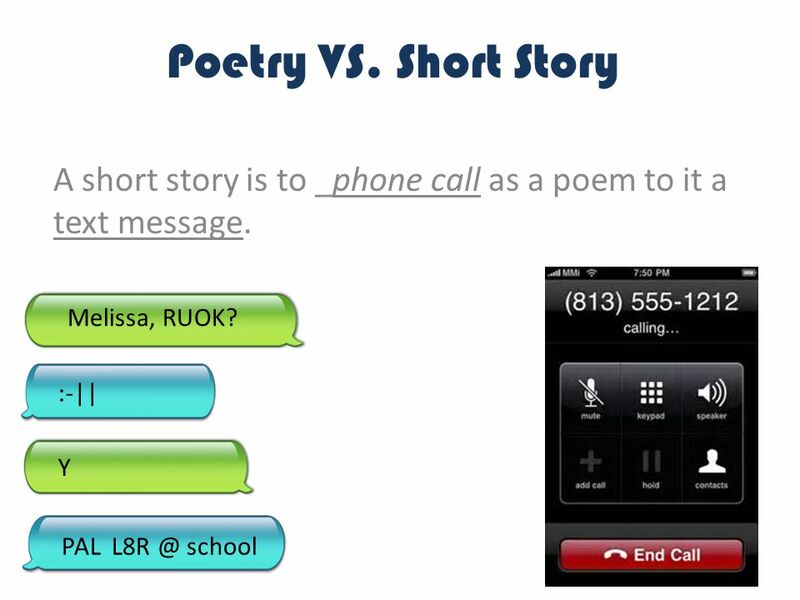 Poetry – Figurative Language and Structure An Introductory Lesson. 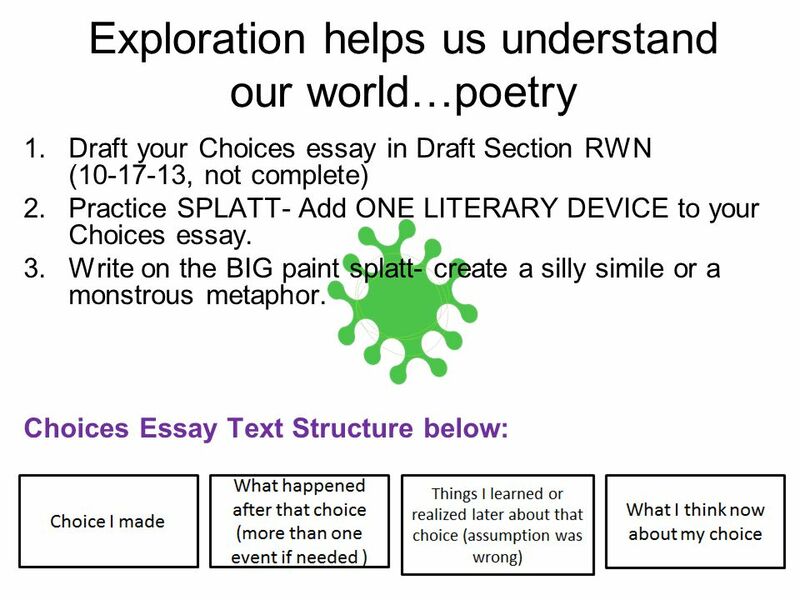 Key Literary Terms Review Y. Fisher Writing in the Content Area Y. Fisher Writing in the Content Area.